There's a lot to love about Costco, from its seemingly endless aisles of oversized packages of candy and toilet paper to its killer food court. But few can claim to love the members-only bulk goods retailer as much as one couple in Australia, whose obsession runs so deep that they recently decided to get married there in front of 90 friends and family members. 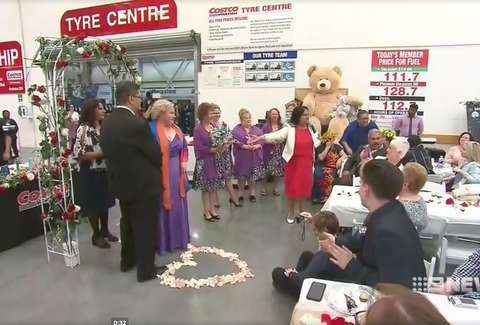 Over the weekend, the couple tied the knot near the tire section of their local store in Casula (a Sydney suburb), which set up a flowered archway and a seating section for 90 guests. They also hosted the reception at the location, featuring a buffet of Costco's signature food and drink items like pizza, meat pies, hot dogs, and soft drinks as well as a cake decorated with flowers, their names, and yes, even the Costco logo. Somethin different....a wedding at @costco? Believe it or not, Berkeley and Bob's wasn't the first wedding Costco has hosted. A couple of stores in the US have done them before (this is the first one Down Under, though). However, it's not as if the chain specializes in matrimony like it does mega-bags of dog food and cereal. You need special permission from the store to be allowed to do it, and you'll also have to be cool letting strangers look on with bewilderment, seeing as they don't close the entire store to regular customers just for your ceremony.